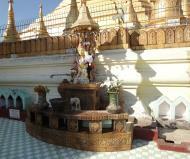 The Shwemawdaw Paya is a stupa located in Bago, Myanmar. It is often referred to as the Golden God Temple. At 375 feet in height, the Shwemadaw holds the record for the tallest pagoda in the country although the Shwedagon Pagoda in Yangon is usually credited as the tallest pagoda in Myanmar (at 98 meters - approximately 321.5 ft). 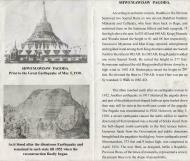 Shwemadaw, along with the Shwedagon and Kyaiktiyo, are famous Mon pagodas. Published November 1, 1799 by G. Nicol. Pall Mall & J. Wright, Piccadilly, London. 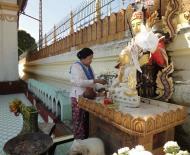 Bago formerly Pegu, is a city and the capital of Bago Division in Myanmar (Burma). It is located 50 miles (80 km) from Yangon. 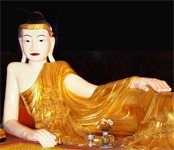 According to legend, two Mon princess from Thaton founded Bago in 573 AD. 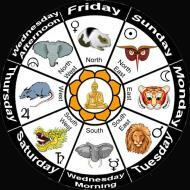 It was written in the chronicles that eight years after enlightenment, Lord Buddha along with his disciples flew around the Southeast Asian countries. On his return journey while crossing the Gulf of Martaban, which happened to be at low tide, he saw two golden sheldrakes sitting, female on top of male, on a peak of land protruding out of the sea just enough for a bird's perch. Viewing this strange phenomenon, he predicted to his disciples that one day a country where his doctrine would thrive would come into existence in this vast sea area. That part of the sea, when it was silted up and ready for habitation approximately 1500 years after the prediction, was colonized by Mons from the Thaton Kingdom. Thus, the Mons became the first rulers of this country known in history as Hongsawatoi (from Pali Hamsavati). Other spelling variations on the name include Hanthawaddy, Hanthawady, Hanthawadi and Handawaddy. In Thai, it is called หงสาวดี (Hongsawadi). The earliest mention of this city in history is by the Arab geographer Ibn Khudadhbin around 850 AD. 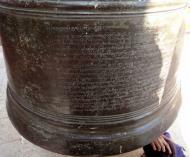 At the time, the Mon capital had shifted to Thaton. The area came under rule of the Burmese from Bagan in 1056. After the collapse of Bagan to the Mongols in 1287, the Mon regained their independence. In Lower Burma, a Mon dynasty established itself first at Martaban and then at Pegu. During the reign of king Razadarit, Pegu and Ava Kingdom were engaged in the Forty Years' War. The peaceful reign of Queen Shin Sawbu came to an end when she chose the Buddhist monk Dhammazedi (1472–92) to succeed her. 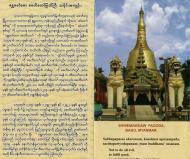 Under Dhammazedi Pegu became a centre of commerce and Theravada Buddhism. From 1369-1539, Hanthawaddy was the capital of the Mon Kingdom of Hanthawaddy, which covered all of what is now Lower Burma. The area came under Burman control again in 1539, when it was annexed by King Tabinshweti to his Kingdom of Toungoo. The kings of Taungoo made Bago their royal capital from 1539–1599 and again in 1613-1634, and used it as a base for repeated invasions of Siam. As a major seaport, the city was frequently visited by Europeans, who commented on its magnificence. The Burmese capital relocated to Ava in 1634. In 1740, the Mon revolted and founded the Restored Hanthawaddy Kingdom. 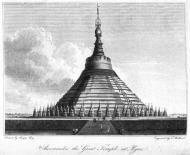 But Burmese King Alaungpaya captured the city in May 1557, ending the Mon's short-lived independence. Bago was rebuilt by King Bodawpaya (r. 1782-1819), but by then the river had shifted course, cutting the city off from the sea. It never regained its previous importance. After the Second Anglo-Burmese War, the British annexed Bago in 1852. 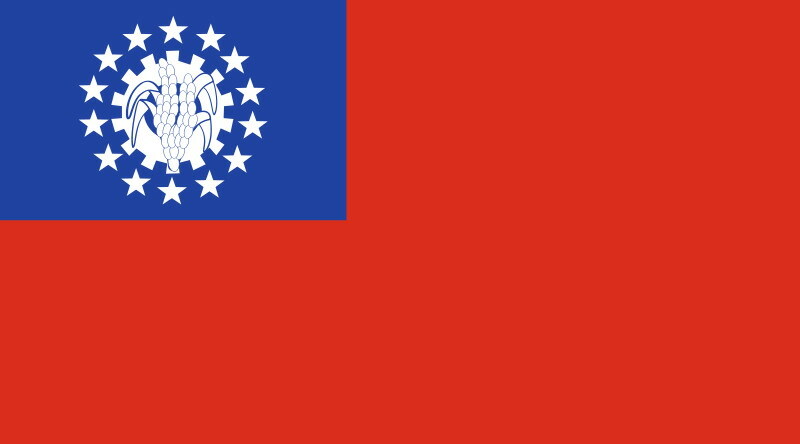 In 1862, the province of British Burma was formed, and the capital moved to Yangon. The name Bago is spelt peh kou literally. The substantial differences between the colloquial and literary pronunciations, as with Burmese words, was a reason of the British corruption 'Pegu'. 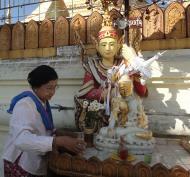 In 1911, Hanthawaddy was described as a district in the Bago (or Pegu) division of Lower Burma. 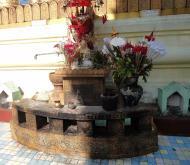 It lay in the home district of Yangon, from which the town was detached to make a separate district in 1880. It had an area of 3,023 square miles (7,830 km2), with a population of 48,411 in 1901, showing an increase of 22% in the past decade. Hanthawaddy and Henzada were the two most densely populated districts in the province. Hanthawaddy, as it was constituted in 1911, consisted of a vast plain stretching up from the sea between the To (or China Bakir) mouth of the Ayeyarwady River and the Pegu Yomas. Except the tract of land lying between the Pegu Yomas on the east and the Hlaing river, the country was intersected by numerous tidal creeks; many of which were navigable by large boats and some by steamers. The headquarters of the district was in Rangoon, which was also the sub-divisional headquarters. The second sub-division had its headquarters at Insein, where there were large railway works. Cultivation was almost wholly confined to rice, but there were many vegetable and fruit gardens. Today, Hanthawaddy may be considered a district of the city of Bago.